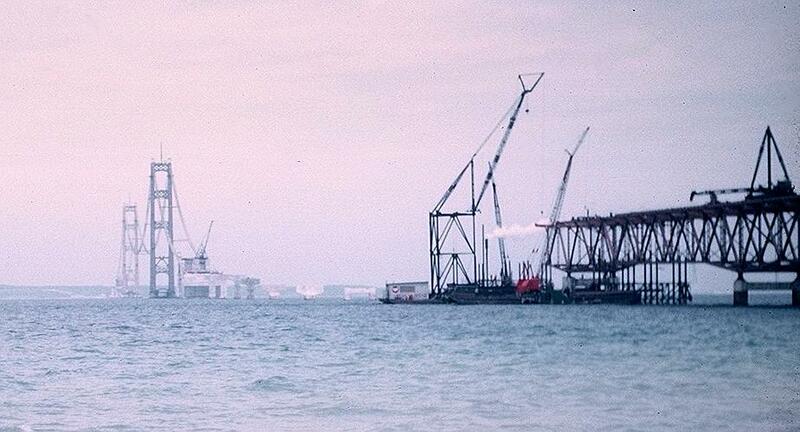 Moving more of the Mackinac Bridge superstructure into position. Cranes preparing to raise a truss section of the framework into place. catwalk. 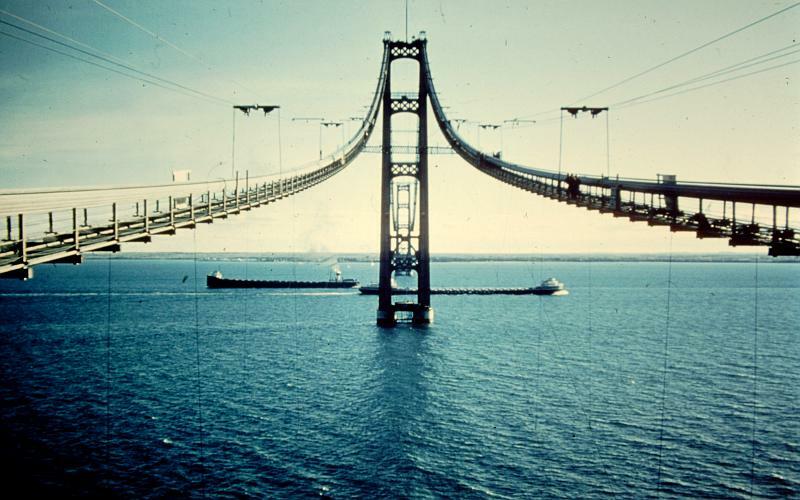 Despite the popular myth, there are no bodies buried in the concrete piers of the Mackinac Bridge. 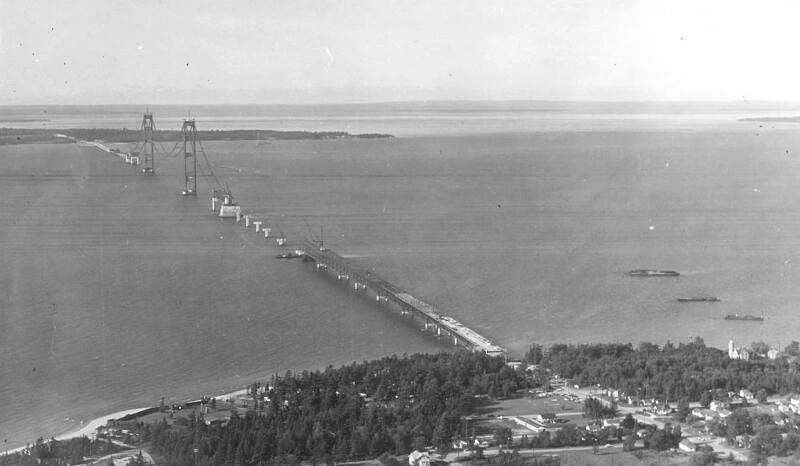 Mackinac Bridge from the air on Labor Day in 1956. Fort Michilimackinac is at the lower left and Old Mackinac Point Lighthouse is at the right. The lighthouse was decommissioned in 1957 when the lights on the Mackinac Bridge made it no longer necessary. It is a museum today. 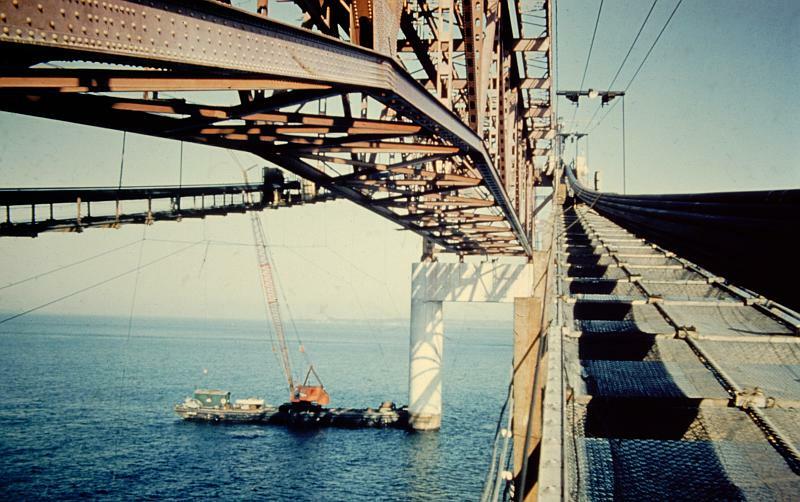 As the work is suspended for the winter of 1956-57, the bridge roadway is nearly completed up to the two anchorages. Mackinac Bridge towers with two Great Lakes freighters. 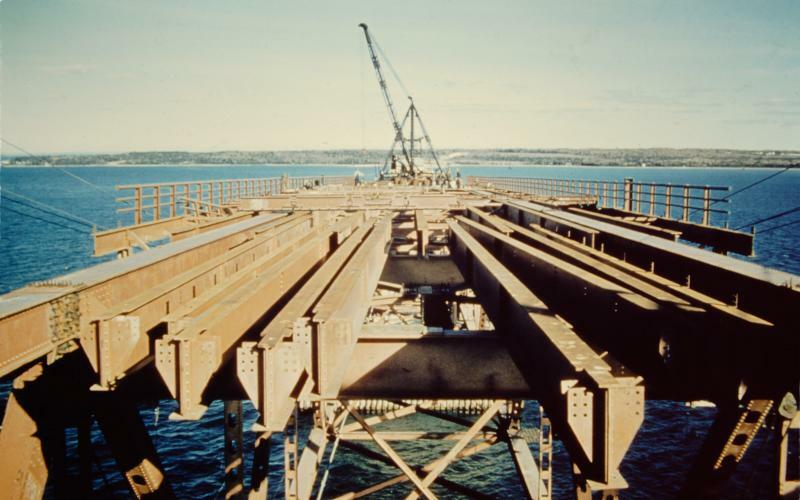 Roadway stringers being assembled in place above the truss section which had been raised near the north anchorage. 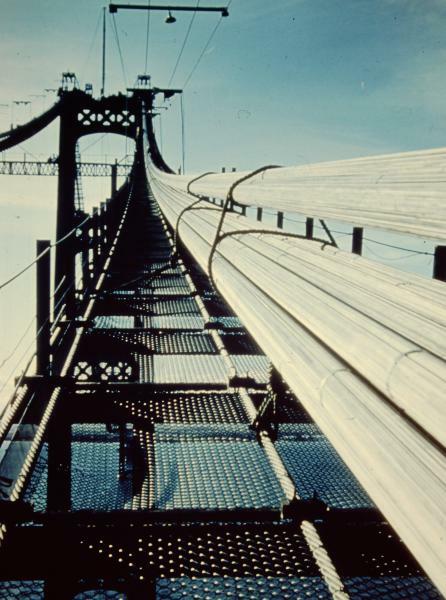 Temporary catwalk with cable under construction. Looking up at the metal superstructure from the anchorage. 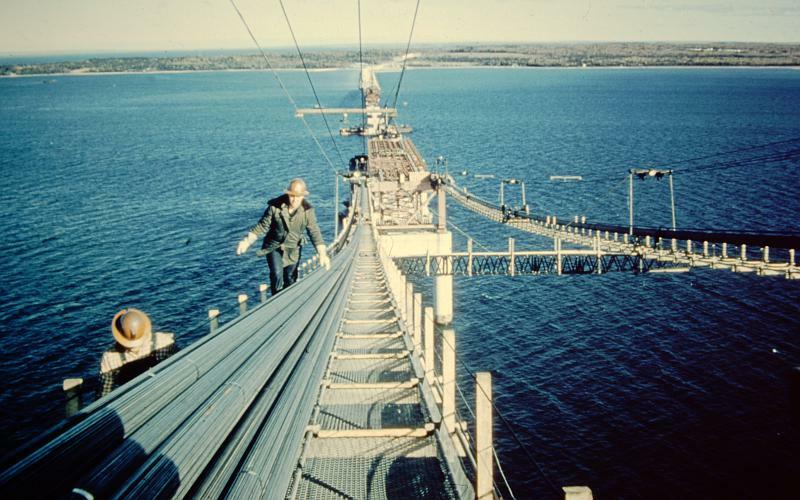 In the summer of 1957, roadway truss sections are suspended from the North and South Mackinac Bridge towers. 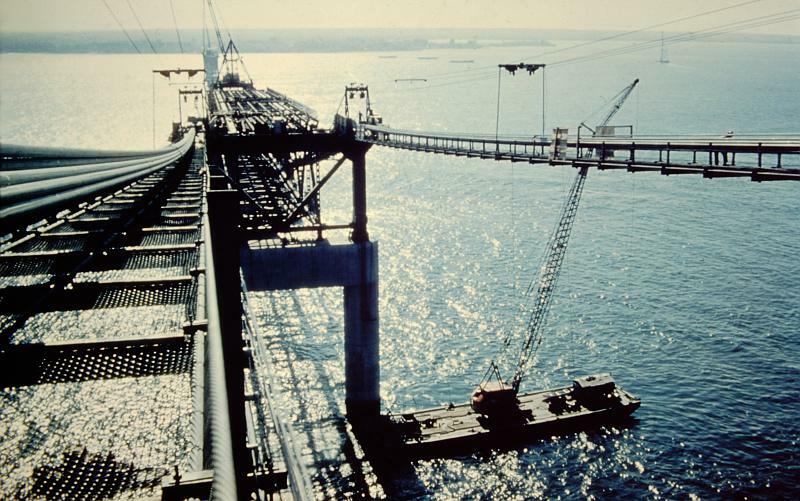 Preparing to raise a stiffening truss unit from a barge, into its position near the south end of the suspension span. The large Great Lakes freighter passing the North Mackinac Bridge tower looks small by comparison.